This is one of those recipes our family adores. We eat it for dinner quite frequently, and L. especially loves to see it turn up in his lunchbox. Sure, it’s just a BLT, sort of deconstructed — but it’s a darned delicious one. Big cubes of bread, sweet bursts of tomato, a tangy dressing, and smoky bacon just can’t be the wrong answer, as far as I’m concerned. So after mentioning it so many times here on the blog, I thought it was high time to include it in my lunchbox roundup. After all, if my kids love to see this show up in their lunches, yours might, too. To make the croutons, toss the cubes of bread with a drizzle of olive oil and a pinch of salt and pepper. Spread them out on a baking sheet and toast in a 400 degree oven for about 15 minutes, until golden brown and crunchy. In a large skillet over medium-high heat, cook bacon until crisp. Remove from the pan with a slotted spoon and drain on paper towels. 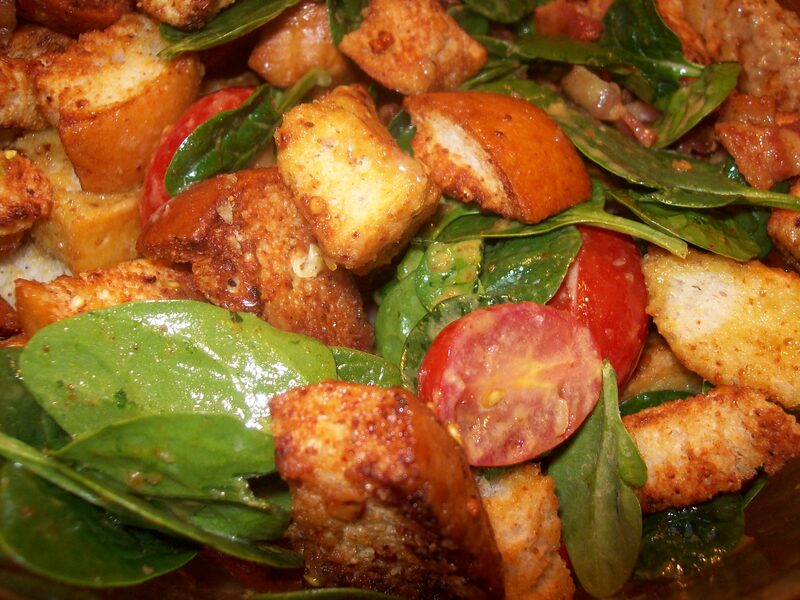 In a large bowl, combine bacon, croutons, grape tomatoes, and spinach leaves. Combine mustard, garlic, lemon juice, and honey in a blender. Blitz until smooth, then slowly drizzle in the olive oil with the motor running to make a smooth dressing. Add salt and pepper and mix thoroughly. Pour the dressing over the salad and toss until all the croutons and vegetables are evenly coated.